Barbie just might be the most famous doll in the world. She has represented fifty different nationalities. She’s stepped into the always-fashionable shoes of more than one hundred twenty careers. She has been played with, studied, celebrated, and criticized for more than fifty years. And she has unquestionably influenced generations of girls?whether that influence has been positive or negative depends on whom you ask. 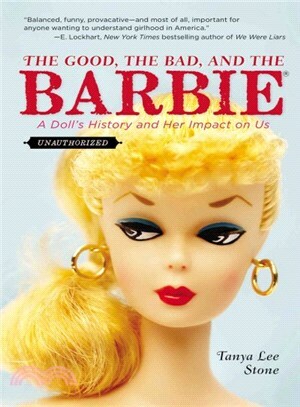 Acclaimed nonfiction author Tanya Lee Stone takes an unbiased look at how Barbie became the icon that she is. Part biography?both of the doll and of her inventor, Ruth Handler?and part exploration of the cultural phenomenon that is Barbie, The Good, the Bad, and the Barbie is filled with personal anecdotes, memories, and opinions from people of all ages. Featuring original color and black-and-white photographs, this book is for everyone who understands that we’re all living in a Barbie world. Tanya Lee Stone is an award-winning author whose works have received critical acclaim and accolades including ALA’s Sibert Medal (for informational text) and SCBWI’s Golden Kite Award. She is also the author of the YALSA Award Finalist for Excellence in Nonfiction, Almost Astronauts: 13 Women Who Dared to Dream. She lives in Burlington, Vermont.